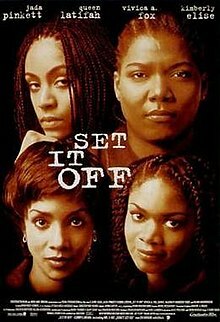 Set It Off is a 1996 American crime action film directed by F. Gary Gray and written by Kate Lanier and Takashi Bufford. The film stars Jada Pinkett, Queen Latifah, Vivica A. Fox and Kimberly Elise (in her film debut). It follows four close friends in Los Angeles, California, who decide to plan and execute a bank robbery. They decide to do so for different reasons, although all four want better for themselves and their families. The film became a critical and box office success, grossing over $41 million against a budget of $9 million. Francesca "Frankie" Sutton (Vivica A. Fox) is a Los Angeles bank teller who witnesses a robbery. Although she had no prior knowledge of the robbery, the bank fires Frankie after she confirms for the detectives that she recognized one of the robbers from her neighborhood but she did not personally know him. Because Frankie was slow to react during the robbery detective Strode (John C. McGinley) and his partner (Ella Joyce) do not believe her. Before leaving Frankie asks detective Strode "what do you do when there's a gun to your head"? Frankie goes to work at Luther's Janitorial Services with her three best friends, Lida "Stony" Newsom (Jada Pinkett), Cleopatra "Cleo" Sims (Queen Latifah), and Tisean "T.T." Williams (Kimberly Elise). Luther (Thomas Jefferson Byrd) treats them with disrespect and pays them paltry wages. Tired of working a low-paying job, Cleo states that they should rob a bank themselves. Frankie agrees, but Stony and T.T. are reluctant. However, when Stony's younger brother is gunned down by the police in a case of mistaken identity and T.T. 's son is taken away from her by Child Protective Services after he drinks cleaning chemicals at T.T. 's job, they too now have the motivation to join the robbery. The four women embark on a series of successful bank robberies, due to Frankie's inside knowledge of bank protocol with money and security. An investigation by LAPD Detective Strode ensues. Strode suspects that Cleo (because of her prior convictions), Frankie (because of her inadvertent connection to the earlier robbery and subsequent firing) and Stony (because of her brother's death) are involved. But his superior refuses to allow him to bring them in for questioning because he doesn't feel the evidence is sufficient. Concerned with the safety of their money, the four women stash the money in an air vent at one of their work sites. While casing a bank with T.T., Stony meets bank manager Keith Weston (Blair Underwood). Stony and Keith immediately start dating. When Cleo, Frankie, and T.T. show up for work one day and find a new boss in charge, they quickly realize that Luther has discovered the money and fled with it. While Stony attends a banking event with Keith, the three women track Luther to a motel, where he is sleeping with a prostitute; they demand the return of their money. Luther informs them that the money is nearly gone. Luther then pulls a gun on Cleo; T.T. kills him in self-defense. Cleo takes the prostitute's ID and threatens her to not tell the police about them. The next day, Detective Strode takes Cleo to the police station to participate in a lineup. A glare from Cleo intimidates the prostitute into silence. Stony is disappointed with Frankie and T.T. about the missing money and Luther's death. Frankie and Cleo persuade T.T. and Stony that they need to rob another bank and leave town the next day. The women decide to rob Downtown Federal bank, the bank that Keith works at. Concerned for Keith's safety and not wanting him to know she's a bank robber, Stony calls Keith and tells him to meet her at a cafe, far from the bank's location. The four women quickly execute the robbery but Cleo demands that T.T. grab more money. This causes them to take more time, resulting in Strode intercepting them before they leave. Strode and his partner try to talk them into surrendering. As T.T and Stony begin to put down their weapons a bank security guard jumps out and shoots T.T. A shootout ensues as Stony shoots the guard, and an enraged Cleo opens fire on the detectives. The women eventually drive away and as they proceed to switch getaway cars, T.T. succumbs to her wound and dies in Stony's arms. The three remaining women attempt to outrun the police in vain. They become trapped in a street tunnel by police helicopters. Cleo tells Stony and Frankie that they have to split up and to take her money with them. Cleo tells Stony and Frankie to pin them selves against the tunnel wall while she distracts the police. The police find Cleo who proceeds to lead them on a high speed chase. After her car is shot up by police, Cleo leaps from her car in one final battle for her dignity, firing her gun, and is shot down by the police. Frankie is found a short time later. Strode orders the police not to fire and he attempts to get Frankie to surrender. Frankie puts a gun to Strode's head and repeats her earlier question to him "what do you do when there's a gun to your head"? Frankie attempts to run; she is shot in the back and killed by an agitated officer. Stony, who managed to blend in with a tourist group headed to Mexico, tearfully watches this from a passing charter bus. Strode sees her from a distance but lets her go, realizing that he was the cause for all of this. In Mexico, Stony mourns the losses of her friends and brother, and cuts off her hair. Stony calls Keith to assure him that she is all right and thanks him. She hangs up the phone and smiles. Stony is seen driving through the mountains with the stolen money from the robberies in tow. Takashi Bufford said that he wrote the script with Pinkett Smith and Queen Latifah in mind even though he had not yet met them. The script was offered to New Line three times before finally being accepted, and the studio filled in more about why the female leads turn to bank robbery in a way that wasn't in the original script. Set It Off received generally positive reviews from critics and audiences. On review aggregator website Rotten Tomatoes, it holds an overall 64% approval rating based on 25 reviews, with a rating average of 6.1 out of 10. The site's consensus reads: "It may not boast an original plot, but Set It Off is a satisfying, socially conscious heist film thanks largely to fine performances from its leads." Roger Ebert stated that Set It Off is "a lot more" than a thriller about four black women who rob banks. Comparing it to Waiting to Exhale, but "with a strong jolt of reality," he said, "It creates a portrait of the lives of these women that's so observant and informed." He gave the film three and a half stars, and added, "The movie surprised and moved me: I expected a routine action picture and was amazed how much I started to care about the characters." Stephen Holden of The New York Times compared Set It Off to Thelma & Louise, stating, "In formulaic Hollywood terms, Set It Off might be described as Thelma and Louise Ride Shotgun in the Hood While Waiting to Exhale. A pop psychologist might translate the story into a fable called Women Who Rob Banks and the Society That Hates Them." He added that among "the long list of Hollywood heist movies that make you root for its criminals to steal a million dollars and live happily ever after, F. Gary Gray's film Set It Off is one of the most poignantly impassioned," and that "[i]f this messy roller coaster of a film often seems to be going in several directions at once, it never for a second loses empathy" for the female robbers. James Berardinelli said that if Set It Off owes any debt to films, those films are Thelma & Louise and Dead Presidents, rather than Waiting to Exhale. He stated that "[t]here's a freshness and energy in the way director F. Gary Gray attacks this familiar material that keeps Set It Off entertaining, even during its weakest moments" and that "[t]he concept of four black action heroines makes for a welcome change in a genre that is dominated by: (a) rugged white males with a perpetual five o'clock shadow, (b) rugged white males who speak English with an accent, and (c) rugged white males with the acting ability of a fence post." Berardinelli added that although "[t]he film doesn't get off to a promising start" and "[t]he first half-hour, which details the various characters' motives for becoming involved in a bank robbery, is unevenly scripted," and that some aspects of the plot are contrived, "[o]nce the setup is complete, however, things shift into high gear. The remainder of the film, which includes several high-adrenaline action sequences and some slower, more dramatic moments, is smoothly-crafted. There are occasional missteps, such as an out-of-place Godfather parody, but, in general, Set It Off manages to rise above these." On a budget of $9 million and R-rated, Set It Off grossed $36,461,139 in the U.S. and Canada, $5,129,747 internationally, and $41,590,886 worldwide. Tribute magazine stated that it is New Line Cinema's highest-grossing film of 1996, and that it won Gray a Black Film Award for Best Director, and the Special Jury Prize at the Cognac Film Festival. The soundtrack was released on September 24, 1996 by East West Records and featured production from several of hip hop and R&B's top producers such as Organized Noize, DJ U-Neek and DJ Rectangle. The soundtrack was a huge success making it to number four on the Billboard 200 and number three on the Top R&B/Hip-Hop Albums and featured seven charting singles "Set It Off", "Don't Let Go (Love)", "Days of Our Livez", "Angel", "Come On", "Let It Go" and "Missing You". All of the singles had music videos made for them. The track "The Heist" by Da 5 Footaz also had a music video made, even though it was not released as a single. On November 12, 1996 the album was certified platinum by the RIAA. "Up Against the Wind" (runtime – 4:28), sung by Lori Perri and produced by Christopher Young, is not included in the soundtrack. Varèse Sarabande issued an album of Christopher Young's score for the film, including Lori Perri's "Up Against The Wind" on November 19, 1996. ^ a b c d "Set It Off". Box Office Mojo. Retrieved October 9, 2014. ^ a b c "F. Gary Gray Bio". Tribute. Retrieved October 9, 2014. ^ "'Set It Off' 15 Years Later - blackfilm.com/read". 10 November 2011. ^ "Set It Off (1996)". Rotten Tomatoes. Retrieved July 30, 2013. ^ Ebert, Roger (November 8, 1996). "Set It Off Movie". rogerebert.com. Retrieved October 8, 2014. ^ Holden, Stephen (November 6, 1996). "Set It Off (1996): Just Trying to Get Even While They Get Rich". The New York Times. Retrieved October 9, 2014. ^ Berardinelli, James (1996). "Set It Off". reelviews.net. Retrieved October 9, 2014. ^ "Various - Set It Off (Music From The New Line Cinema Motion Picture)".